From March 15 through April 13, 2016 Mother Earth’s evolving Fifth Dimension Transition reached a critical stage in her transformation from a Fourth Dimension Creator Planet to a Fifth Dimension Creator Planet – Mother Earth Activated her Fifth Dimensional “services!” Through the Activation of her Fifth Dimension Harmony Vibration Field, Mother Earth signaled to the Universe and her Solar System that she was ready to emerge as a Fifth Dimension Creator Planet of the Universe on May 22, 2016. Many of the Changes we have all made in unison with Mother Earth since then have largely been internal rather than external adjustments. But the Time to move forward with Mother Earth has come, the Time for every Soul aligned with Mother Earth’s Fifth Dimension Harmony Vibration Field to begin Manifesting the Fifth Dimension on Earth! 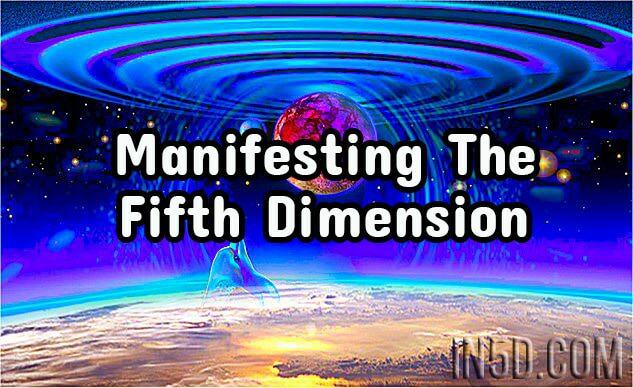 From October 17 through November 16, 2016 a new theme will be rising in our evolving process to experience the entirety of the Universe’s Fifth Dimension, the theme of Manifesting the Fifth Dimension! The manifestation of the Fifth Dimension on Earth will not solely happen through our Mother Earth’s replication of the Universe’s Fifth Dimensional elements of Universal Light, Universal Love, and Universal Harmony. These are just the building blocks, dear Ones! The actual manifestation of the Universe’s Fifth Dimension on Earth will occur through you and your own ability to enter into your Manifestation Zone! Your Manifestation Zone is your internal place of no fear, no interruption, no distraction, and no hindrance to whatsoever you will think, say, and do – the Freedom Zone within your Heart and Soul! Nothing deters us more than a feeling of fear, stress, or anxiety, in what we may think, say, and do from our Heart and Soul. Many have failed and faltered towards the achievement of his or her hopes, wishes, and dreams through the “well meaning” words and actions of others. Though they meant well, the “well meaning” people in our lives had our best intentions in mind as they sought to “help” us by reminding us of “reality” – the reality where we need a roof over our head, food on the table, and a job leaving us to spend our time dreaming about the Reality of our Heart and Soul! Some people do realize the hopes, wishes, and dreams of his or her Heart and Soul, but these are far and few amongst the masses! Mother Earth’s Fifth Dimension is designed for the Reality of the Heart and Soul, dear Ones! Any previous experiences in your Manifestation Zone – the Freedom Zone within your Heart and Soul – will contribute to your future wonders! Our Manifestation Zone appears to us whenever we enter Spiraled Time, the experience of choosing to be in the Present Moment of NOW! The common Fourth Dimensional practice of observing the movement of time in a linear mode, keeping track of time from one beginning event to a concluding event, is what deters us from maintaining our constant presence within our Manifestation Zone and our Life’s Purpose! Moses’ “burning bush” in the account of the Bible’s Exodus 3:3 appeared to him when he was internally prepared and ready for its manifestation. We are now similarly moving towards being in our own state of internal preparedness and ready for Manifesting the Fifth Dimension! What will instigate our movement into the personal space of our Manifestation Zone on a continual basis will be largely dependent upon the degree we use Time in its true sense, Time as the movement of the Soul! For whenever we utilize our Time for progressing our Soul we will also be finding and making Time to experience Spiraled Time and thereby entering into a state of a perpetual Manifestation Zone! Sometimes we do get distracted through other concerns interfering with our daily routines. But as long as we find Time to expand and increase our experiences of Spiraled Time, the experience of choosing to be in the Present Moment of NOW, the more our internal world will work to achieve our hopes, wishes, and dreams for Manifesting the Fifth Dimension! On December 4, 2016 Mother Earth will begin whisking away whatever remnants of her Fourth Dimension Harmony Vibration Field may exist upon her! Her actions will thereby make it easier for you, dear Ones, to assist in Manifesting the Fifth Dimension upon her body! It will not be easy just yet as there are still many Souls not adapting to Spiraled Time. Mother Earth is in a process of changing, not by the incremental degrees of the past but by the leaps and bounds of REAL CHANGE produced by the speed of light! Beginning with the Energy of December 4, 2016, dear Ones, the possibility exists of manifesting all your hopes, wishes, and dreams as Mother Earth Activated her Fifth Dimensional “services” from March 15 through April 13, 2016! The process of Creating with the Universe is not a process of instantaneous manifestation where we simply think about what we want and it suddenly appears, but a process involving every thought, emotion, perception, and choice we have ever made! We are now capable of Manifesting the Fifth Dimension with the individual knowledge we have accumulated towards the achievement of fulfilling our hopes, wishes, and dreams arising within our Heart and Soul! For most of us already aligned with Mother Earth’s Fifth Dimensional Vibration, our Time experienced through Spiraled Time will be functioning to accelerate our progression in the achievement of what we came to originally do in Mother Earth’s Fifth Dimension – Manifesting the Fifth Dimension with her, through her, and for her as a Co-Creator in Unity with God! Try not to worry about the many signs appearing on your local media outlets demonstrating Mother Earth whisking away the remnants her Fourth Dimension Harmony Vibration Field! Instead move into your internal place of no fear, no interruption, no distraction, and no hindrance to whatsoever you will think, say, and do – your Manifestation Zone – the Freedom Zone within your Heart and Soul!